The Badlands were named “bad” because they were horrible to travel over in the days of wagon trains. There was little water, no plants, no cover, and difficult terrain to cover. The National Badlands Park was beautiful, however. We could see that the terrain would be difficult to travel, and indeed, there is little life, paths and ways to live off the land. My expectations of the Badlands was a neutral colored landscape, with little variation. What I saw was amazing! Shades, variations, textures, rolling hills, colors in bands of the soils, plants in crevices, water-shaped canyons, rippled walls from erosion- all these words describe the Badlands. 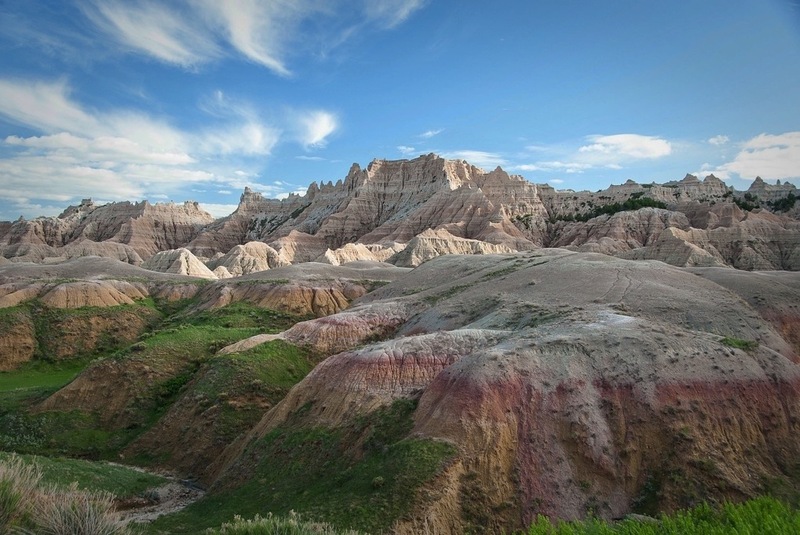 This image is one of many that show the beauty of the Badlands.